35 days before the World Cup four stadiums are still under construction and delays are growing. As if that wasn’t bad enough, another worker was killed yesterday. He was electrocuted at Arena Pantanal. The Cuiaba host stadium, only one in the Mato Grosso province, is one of four World Cup venues still under construction. 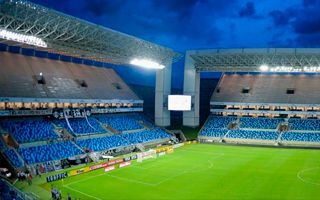 Arena Pantanal continues to miss deadlines, most recently with seat installation. The process was due last weekend, but upper tiers remain empty after delivery of the last seats was delayed again. We’re now 35 days away from the world’s largest football tournament, which means Brazil sets a record in terms of failing to meet contracted deadlines. As if this wasn’t bad enough already, Arena Pantanal was the site of a tragic accident yesterday. A worker was electrocuted and died despite a 20-minute rescue effort. By our count this is already the ninth victim of 12 stadium project works. Three people have died at both Arena Corinthians and Arena da Amazonia, two stadiums with the highest toll. While large projects are prone to construction accidents, domestic supervision suggested many contractors failed to meet safety standards by far, while trying to speed up the projects.